Washington, May 28 (IANS) Two Indian-origin students won the the 2016 Scripps National Spelling Bee, third straight year of double winners. 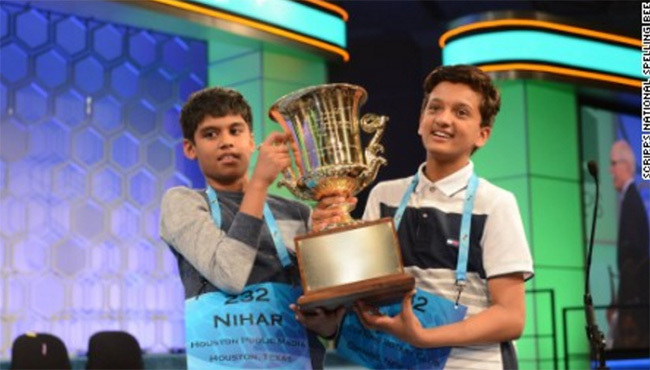 Nihar Janga, 11, of Austin, Texas, and Jairam Hathwar, 13, of Corning, New York, were declared co-champions at the National Spelling Bee on Thursday night, CNN reported. “It was just insane, I don’t even know how to put it in words,” Jairam said. “I’m just speechless. I can’t say anything. I’m only in fifth grade,” Nihar said. Nihar correctly spelled the word “gesellschaft”, which refers to a type of social relationship and Jairam correctly spelled the word “Feldenkrais”, a trademark that refers to a system of aided body movements. Jairam’s brother Sriram won the 2014 spelling championship. Twice, it looked as if Jairam would be eliminated, after he misspelled “drahthaar”, a breed of dog, and “mischsprache”, a language. But Nihar missed his follow-up words, which put Jairam back in contention, USA Today reported. The spellers took home $40,000 in cash and other prizes. Ten contestants made it to the finals and competed for the title of national champion before a live television audience. The bee began Tuesday with 284 (boys: 143 and girls: 141) contestants but was pared to 45 Wednesday evening, after a written test and two rounds of onstage spelling. By Thursday afternoon, the field had been further narrowed to the 10 finalists, who came from California, Colorado, Florida, Indiana, Massachusetts, New York and Texas. For the first time, competitors included a first-grader – 6-year-old Akash Vukoti of San Angelo, Texas. Last year’s winners were Vanya Shivashankar of Olathe, Kansas, and Gokul Venkatachalam of Chesterfield, Missouri.